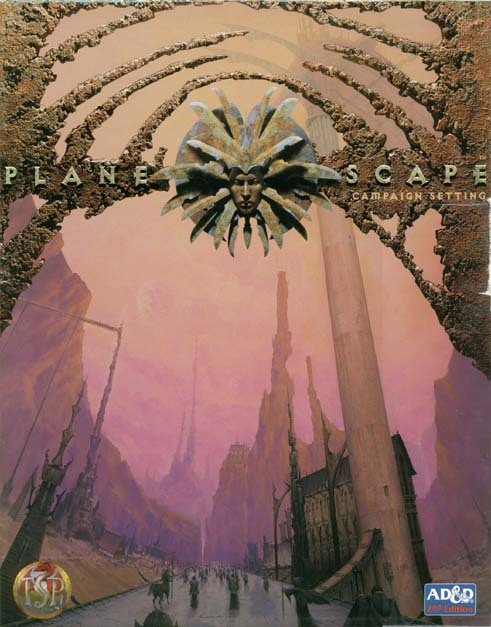 Of all the setting published by TSR, Planescape is my second most favorite setting, the other being Dark Sun. The main reason is that I always enjoyed quirky settings as opposed to the vanilla fantasy of Greyhawk or Forgotten Realms which provide a more traditional approach to fantasy. With Planescape, TSR effectively opened the door to many planes of existence and beyond, creating one of the most rich and beautiful settings. This high quality box contained a 32-player's primer to the factions and planes, a DM guide to the planes and a guide to the city of Sigil and beyond. The city is assumed to be the "home base" of the characters, be they native to the planes or from any of the prime worlds (i.e. Greyhawk, Forgotten Realms, or a world of the DM's imagination). It also included several high quality maps. What really stands out as I re-read these recently are Tony DiTerlizzi's illustrations. These are really very, very good and set the tone of the setting: grim, dark and more than a bit off-the-wall. TSR wisely used mostly of DiTerlizzi's imagery in all he Planescape products, thus maintaining a visual consistency unrivalled by any of the products of the same era. What really captures my imagination, though, are the infinite possibilities for adventures. Each contained setting, such as Greyhawk or Dark Sun, offers a myriad of options for adventures, but each is limited in scope. The planes, however, open the door to a sweeping, epic universe that encompasses all the planes which are vast and some are infinite, and also the many worlds already published or otherwise. An ambitious DM could create a campaign with characters from Faerun, Flanaess, Dark Sun, Mystara, or whatever other fantasy world strikes his fancy, and let the characters wander the multitude of planes. Even though the setting Planescape assumes the planes as the centerpiece of the campaign, there is nothing to stop the DM from creating adventures in prime worlds. Think of the possibilities. Another element that distinguishes Planescape from other settings is that the alignments shape beliefs. Whereas in more conventional AD&D settings, alignments are a mere indication of behavior, in Planescape, they are true philosophies and shape the mood of the setting as much as or more than anything else. Sigil is controlled, in a way, by factions whose alignments dictate not only how they should behave but their metaphysical beliefs on a grander scale. Each plane corresponds to a specific alignment whose beliefs often clash. Wars are fought for alignments. Some spells may or may not work based on alignment and where in the planeverse they are cast. In a way, they are a powerful reminder that this is a setting unlike any other. The boxed set spawned a number of products that mostly maintained the high quality set by it. This is play on a grand scale, transcending one specific setting. It is a truly epic playground where the players can meet the very deities they worship and many doors lead to infinite places. It is also a very demanding setting with a very specific mood, but I love it all the more for it for it isn't your average vanilla fantasy world. For all its qualities, it remains one of my two favorite AD&D settings.